Over the weekend I was shopping at a large mall in Paramus, New Jersey called the Garden State Plaza Mall. The mall has many high end stores, restaurants, food courts, and even a movie theatre. The one thing that I noticed everywhere when I was shopping is that a lot of women were using the Michael Kors Handbag. I saw them in all sorts of shapes and colors and women of all different ages were using them. It is a very stylish bag and the price is very affordable which is great right now. The bag is even more affordable than the Louis Vuitton or Gucci bag and looks just as good. Well we happened to be walking past the Michael Kors Store and I had to walk in and when I did there was loud music blasting and all of the sales girls were dressed in short black dresses with very large heels. All of the sales girls looked like they were in a night club. The store was really crowded and there was a long line for buying the handbags. That's when I knew that I had to have one. I picked one out and the sales girl was very helpful. Now I have a present from my husband for me to open up on Christmas, which I can't wait. If you want the latest trend right now I suggest that you go out and buy one. Below you will see a picture of the black python Michael Kors Handbag that I received for a Christmas from my husband. The bag is good because it has a lot of compartments in it and it also has a zipper at the top of the bag. This bag is good because it can go from day to evening. It looks classy and black will go with every outfit you wear. If you can't get to the Michael Kors Store, you can also purchase this bag at Macy's or online at Macy's also. If you don't like this style handbag it also comes in many other styles and colors. 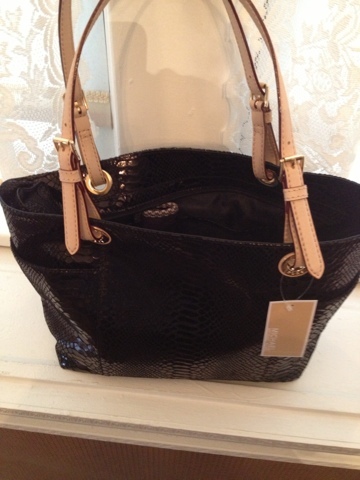 This is a picture of the Michael Kors Black Python Handbag.